A twin pregnancy can be both exciting and nerve-wracking. Read more to learn the ins and outs of being doubly blessed. After patiently waiting to see your midwife or physician, you lie across the table, anxious to see your sweet little baby’s tiny, pounding heart and hear the gentle, rhythmic beat through the Doppler. Then comes the surprise of your life. Not one heartbeat, but two! Chances are that after hearing the big news, you will go through a lot of emotions and concerns, but in the end, you will find only joy in the fact that you will be bringing not one, but two beautiful babies into the world. Shortly after this realization has sunk in, you will likely find yourself wondering what in the world you are going to do with two babies. You may experience anxiety about your health or theirs due to the higher risk of premature birth among multiples. Everyone of these feelings is not only normal, but a little bit expected. After all, even having one baby is a huge responsibility. So what are the facts on twin birth? There are two primary types of twin, identical and fraternal. Though it is a common misconception that all twins are identical, they actually make up the minority of twin births. 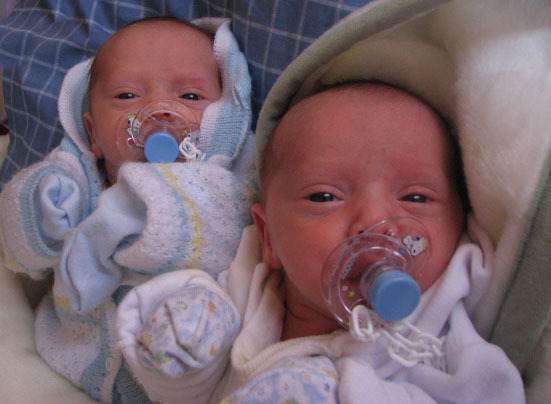 For twins to be identical, they had to come from a single fertilized egg, which split. Fraternal twins, which are far more common, are the result of two eggs being separately fertilized by two sperm at around the same time. Though the rate of cesarean delivery is higher with twins, the majority are still born vaginally. Positioning, caregiver experience, and fetal/maternal health will dictate the possibility of vaginal birth, just as with a singleton birth. Mother’s who are adamant about having a vaginal birth should look for a midwife or physician who is comfortable and experienced in vaginal delivery of twins. Mothers of twins need plenty of additional calories to support the growth and development of two. The ideal weight gain for a twin pregnancy is typically between 35 and 45 pounds, with overweight mothers needing to gain less and underweight mothers potentially needing a bit more. The best way to manage weight during pregnancy is to eat a healthy, balanced diet, heavy in protein. Avoid empty calories and drink plenty of water. Every bite you take is nourishing your little ones, so make smart choices. Women who maintain a healthy diet throughout pregnancy, twin or singleton, will have an easier time dropping the weight after delivery. The likelihood of having twins increases with maternal age. There is also a greater chance of having twins when there is a history on the maternal side of the family. The use of fertility drugs also increases the odds of having more than one. Once your little ones make their arrival, be sure to enlist the assistance of plenty of friends and family. The first few months will be difficult, there is no disputing that, but it is worth it in the end. Are you the parent of a twin? What advice/information do you have for others who are expecting more than one? Enter your information below for special discounts and giveaways!